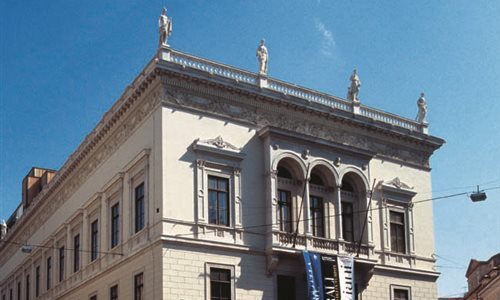 The Revoltella Museum is an important modern art gallery that developed from an institution founded in 1872 by Baron Pasquale Revoltella (1795-1869), who bequeathed his palace and art collection to the city of Trieste. As well as the building and its contents, he also gave the museum a substantial income that allowed it to add to this heritage year by year and rapidly amass a considerable art collection, which by the late nineteenth century included Italian painters such as Hayez, Morelli, Favretto, Nono, Palizzi and Previati, plus many foreign painters. At the turn of the century, thanks to acquisitions made at the Venice Biennale, the collections were enriched with further works of great value, such as the famous painting Lady with a Dog (1878) by De Nittis. During the twentieth century the Museum Revoltella continued to grow, becoming an increasingly prestigious cultural institution and an important reference for modern and contemporary art, presenting all the important names of 20th century Italian art, including Casorati, Sironi, Carrà, Mattes, Bolaffio, Morandi, De Chirico, Manzù, Marini, Fontana and Burri. It has also staged notable exhibitions that have made significant scientific contributions to the knowledge of the art of the past two centuries. In the 60s the museum expanded further by acquiring the nearby Palazzo Brunner where, after a long renovation - begun in 1968 by Carlo Scarpa and finished in 1991 - new exhibition spaces were obtained for the gallery of modern art.